As an amateur gardener, power tools sometimes intimidate me. When possible, I prefer using a manual approach to first become familiar with the techniques, and then move onto power tools when comfortable. My small vegetable garden was ready to be tilled, but I wasn’t yet ready to use my partner’s Troy-Bilt Add-On Cultivator. That thing simply looked scary. Instead, I brought home something that looked effective, manageable, and—frankly—fun: the Garden Weasel Garden Claw Gold Cultivator. The Garden Weasel was a steal for only $30 and a limited lifetime warranty. The body of the tool is made from steel, but it only weighs 5 pounds. Gold-colored handle grips and teeth offset the bright blue color of the main rod. The handle grips resemble the typical stiff material bicycle handlebar grips are made of, so wearing padded gloves was a must for me. The handlebar is bent in a backward “S” shape. I find the shape promotes a natural gripping posture, which in turn makes it easy to twist the tool to the left. Since I am right-handed, I can capitalize on the strength of my right hand and arm when twisting; my partner is left-handed, however, and was able to use the tool just fine as well. Weeds come up easily and completely after every twist. I can simply pick up the weed and its roots in one piece—no need to dig or pull. That’s not to say I don’t have to exert effort. In fact, I found twisting the Garden Weasel pleasantly hard work that did not result in sore muscles but did get my heart pumping. This tiller doubles as an upper body strengthening tool, all for one low price. After a season of use, I noticed the handlebar loosening up a little; it developed a slight hesitation before twisting. It was not overly bothersome but was fixed by tightening the bolt near the handlebar. While the angled teeth do extend out from the main rod, they are still close enough together to be able to make a precise twist close to and even under existing plants. Not once did I accidently till and kill. I use the Garden Weasel primarily to loosen soil prior to planting and to remove weeds. Upon first till, my vegetable garden’s soil was compacted but fairly soft, so all it took to get the tines into the ground was pressure from my foot. After recently bending the blade of a shovel, I was afraid the tines of the Garden Weasel might bend easily, but they show no signs of this. More than once, I struck buried bricks that were used to edge the garden bed and yet the Garden Weasel’s teeth were undamaged. The Garden Weasel can practically do it all. The tool is adjustable from 38 inches to 42 inches, providing back pain-free operation for gardeners of all heights (including gardeners who have back issues, like myself). This makes it a great tool for weeding underneath stairs or a deck. I have used this to remove a few rogue flowers that decided to grow under fences, within a shrub, and under my composter. I have also used it to till unwanted grassy patches and then used the grass clumps to fill the hole of a transplanted bush. By carefully placing the tines only an inch into the ground, I have even rejuvenated my more well-kept decorative flower beds in the front yard by fluffing the mulch with minimal effort. This refreshed the black color by revealing the mulch that wasn’t yet exposed to direct sunlight, giving my bed that just-mulched appearance. I never did move on to that Troy-Bilt Add-On Cultivator. I’m sure it would save me a lot of time and labor, but manually tilling my garden with the Garden Weasel provides me with a sense of satisfaction and ownership. If the area to be tilled is large, the Garden Weasel Claw might be too time consuming and laborious—a power tool is your best bet. The claw is ideal for small- to medium-sized garden beds or small jobs. The claw has earned its right to be a staple tool in my lawn care and gardening arsenal. 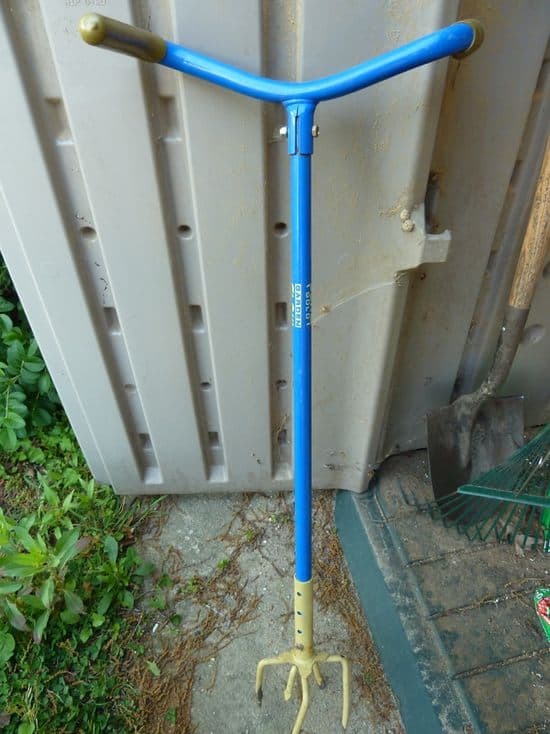 I am looking for a garden claw just like the one here but is only about 6 – 7 inches tall that you can sit and use to loosen dirt, same color blue and yellow , does anyone know where to get one? I have been looking for one 6 -7 inches long too. I can not use a shovel to dig bigger holes and would love a garden tool size claw like the big one. I do have the bigger one and can use it but getting up and down gets painful.